Back in November 2013, I released Doors CSE 8.0, the first shell for the TI-84 Plus C Silver Edition. Although the shell code was the product of my work, and many of the powerful hybrid BASIC routines included were the direct work of Patrick "tr1p1ea" Prendergast or more indirectly "Iambian" Zenith, much of the community had a hand in its creation. I initially did not plan to create a TI-84+CSE shell, and I thought my days of actively developing code in the Doors CS lineage were behind me. However, the community made its voice heard, the need for a TI-84 Plus C Silver Edition shell was heard, and Doors CSE 8 came into being. After listening to the pulse of feedback from developers and users, we are proud to present the next iteration of Doors CSE. Apps are now listed in a special Apps folder and can be run from that folder. The Options menu contains a new option to toggle showing the Apps folder on and off. Apps can include a special icon field that Doors CSE 8.1 will display. 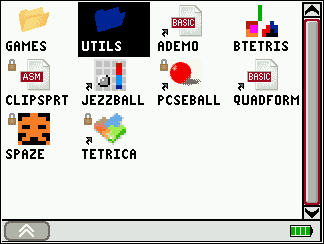 xLIBC function additions include more sprite, keypress, and tilemap functions. Hybrid BASIC fixes include cleaner interactions between xLIBC and the OS, no hourglass shown on-screen when BASIC programs archive and unarchive programs, and bugs in ReplaceLine, InsertLine, ReadLine, and DeleteLine solved. A rare Error: ? that would appear with certain BASIC programs run from Doors CSE has been solved. Many thanks once again to all of the programmers, users, beta-testers, and Cemetech staff who made this possible. Special thanks must go to Electromagnet8, tifreak8x, and Merthsoft, who provided thorough information to track down difficult bugs, and tr1p1ea, who continued to improve xLIBC with new fixes and features. I think that's great news! 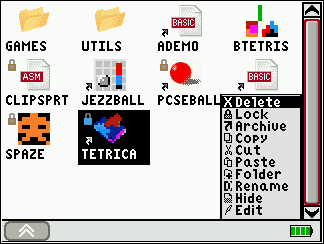 Though, you still have the old icons for Spaze and maybe Jezzball, don't recognize that icon. Aw dang, it can't solve the "Error: ?" outside of Doors. Haha I'm just kidding. But lucky for me, it stopped happening on my calculator. Is the issue affecting real( in actual math applications still a problem? Also elfprince im not sure what you mean? If you want to use real( for math then you just disable the hook in the APP? Otherwise there are ways to achieve the same result using other functions. To help narrow this down, can you please tell me which Apps you have on your calculator? Does this happen regularly when you open the Apps folder, or very rarely? I would like to be able to edit asm prgms and also see any grouped objects i might have while in doors instead of exiting and pressing [2nd] [Mem] [group]. Maybe just for fun being able to change the colors of the menus. other than that man i love the new doors! Okay as for lib helper if you select xlib (not the color table) after you scroll through a certain amount of pages it throws you a domain error, probably because there is too much text for one page. Editing asm on calc is a bad idea, and DCS will never have that ability, since an asm program is compiled, you'd need an oncalc de-compiler for it. AS to the rest, Kerm will have to answer that. Editing ASM programs is far, far outside the scope of what Doors CSE will be able to do. That would require a disassembler, an editor, and an assembler, and is a set of features best included in an external program. I recommend learning more about assembly if you're not already too familiar with it; you'll see it's much harder to edit an existing program than in TI-BASIC. That would certainly be fun, but at the moment I lack the space to include that feature. Please do let us know what issues you found with LibHelper; the Library Helper topic here would be an ideal place for it. TIFreak8x, can you replicate the Icon Creator bug report? Is DoorsCSE 8.1 the same as release candidate 2? Or are there updates that I should download? Also what does "improve basic editor" do? what does "improve basic editor" do? edit: never mind, I'm an idiot. The box wasn't checked, and I wasn't accessing it from DCSE. Speaking of which, though- is there any way to trigger the advanced TI-Basic editor without pressing EDIT from within DCSE? © Copyright 2000-2019 Cemetech & Christopher Mitchell :: Page Execution Time: 0.101153 seconds.